Here’s your cheat sheet for Oz Bomb by Arbor Ales. They’ve been brewing in Bristol since 2007, making a good name for themselves producing a wide range of beers often using experimental hops. Featured in main subscriber box on 1 March 2018. 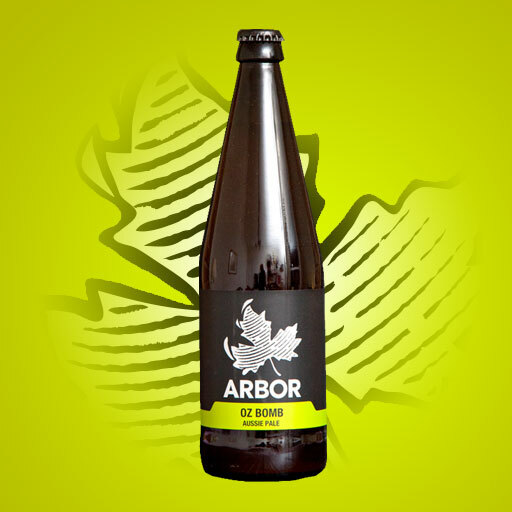 Find the brewery on Twitter at @arborales; they don’t seem to be on Instagram. Serve this beer at 7°C to 10°C; at least an hour in the fridge, maybe up to 90 minutes. Or just stick it outside for a bit and let the Beast from the East do its work. They call it an Aussie Pale, presumably because of the Australian hops, but really American Pale Ale is the style, so you know the drill: pale biscuity malt, fruity tropical hops, but lighter than you’d get from an IPA. Reviews online confirm this, with an aroma and flavour of orange often also making an appearance alongside the tropical notes. Sounds like it could be a very quaffable banger. Beers like this go well with a large range of food. If you’re huddling indoors with this beer avoiding the snow, perhaps something warming and spicy would be good. Mexican perhaps – pulled pork I think should do very well. Or maybe just a hot cross bun. Read more on this beer from BeerBods and Arbor Ales.